Old male at 12 metres, using 50 mm focal length equal to a human eye. 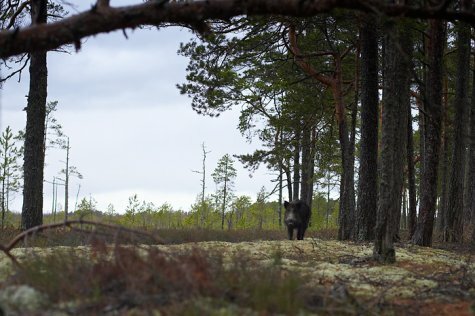 Wild boar have shown up in the Forest Camera for a week, mostly around midnight. The male boar accompanying the herd has driven off the young males or the older sows whose heat period is beginning have managed that. There is some rivalry between the solitarily living males, the strongest gets the "rights“ to the adult sows. Collisions between equal males can end quite bloodily, if the weaker does not retreat without a trial of strength. The „self-sharpening“, upwards turned powerful eye teeth or tusks are quite dangerous for both competitors; some protection against injury is provided by the under-skin strong connective tissue. At nights we have also seen singly moving and feeding smaller young males in the web camera; the large individuals don’t press to pose alone for the camera. The shoulder height of an adult male may be a metre, the trunk more than one metre and a half, and weight more than a couple of hundred kilos, and those are still not the biggest specimens.